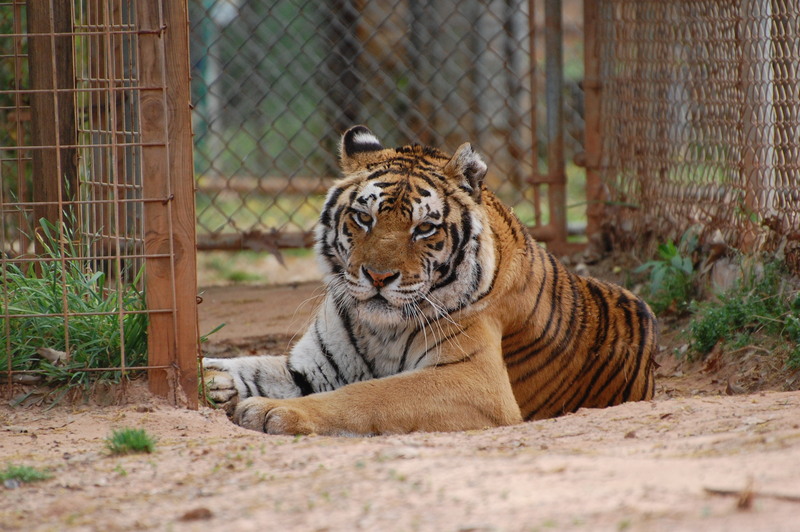 Katrina, a Bengal tiger, came to us after some breeding studies were finished at a major zoo. Once the studies were over, there was no need to keep Katrina as she was not part of the Species Survival Program. The zoo contacted the breeder they got her from and he did not want to take her back, so we were contacted. When Katrina got here, she was aggressive. She fought with the other cats next to her and roared at the keepers. We contacted another place that had more space and they agreed to take her. Unfortunately, they also had ties with a breeder and ended up giving Katrina to the breeder. Katrina unloaded easily and was relieved to be away from the breeder. Katrina was never a cat that wanted affection, so if anyone tried to get close to her she would get agitated and lunge at the fence. As time went on, she realized no one was going to hurt her. Because of that trust, she has allowed me to enter her enclosure to move her to the exercise yard or load her into a transport cage for medical treatment. It’s been amazing to watch such an abused tiger relax and enjoy living her life. Although we can’t have the kind of relationship we have with other cats, we have the kind of relationship SHE needs. Support Katrina and other tigers in need! Give a donation to Tiger Creek International.